A few coworkers liked this one Mexican/Salvadoran restaurant near work in Mountain View, but the original location closed and relocated to a bigger and nicer location. I had recently come back to the Bay Area from Asia, so I was craving something non-Asian. So, we decided to check out the restaurant’s new location for Foodie Friday! Taqueria La Bamba Ay Caramba is a popular lunch spot for burritos and other Mexican foods, but they’ve got dishes unique to El Salvador (Salvadoran) as well. I got something of both, fish tacos and papusa. The latter is Salvadoran. Papusa is a round cornmeal-based tortilla filled with cheese, pork, and refried beans. It was served with curtido (lightly fermented cabbage salad) on the side. If you like cheese and pork, try this dish if you’re feeling like eating something different. The beans weren’t overpowering at all, if you’re not a fan of beans. refried beans (frijoles refritos), or queso con loroco (loroco is a vine flower bud from Central America). 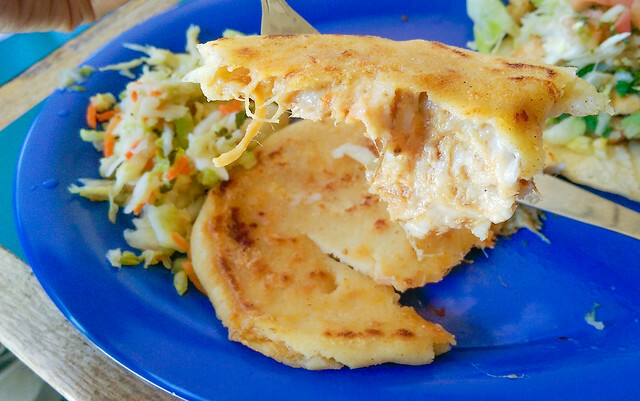 The two most common pupusas are the pupusa de quesillo (cheese) and more popular pupusa mixta with mixed ingredients of cheese, beans, and chicharrón. 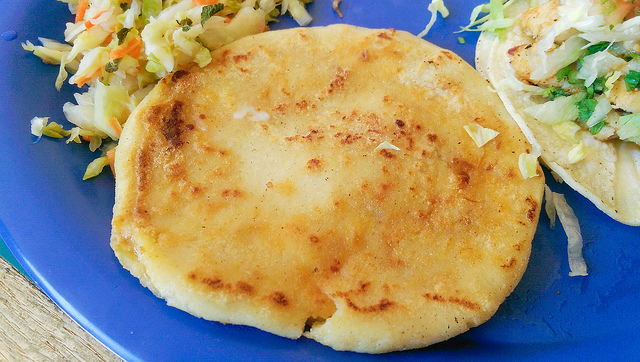 Pupusas are typically served with curtido (lightly fermented cabbage slaw with red chilies and vinegar).